This is the Tricopter LR (Long Range). Efficient, nimble, transportable and with long flight time, those were the goals when designing this copter. The low drag and long flight time make this copter very well suited for long range explorative flying. There are few things more exhilarating than flying high and far. Navigating by landmarks, flying above the clouds at sunset, diving down mountains and exploring the surroundings is the name of the game*. The thrill of knowing it’s only your own navigation skills that will get your copter back is very addictive, not to mention the incredible views you get to experience. *Might be subject to rules and regulations in your country. You should always make sure to follow any local rules! The Tricopter LR ticks all the boxes when it comes to this type of flying. 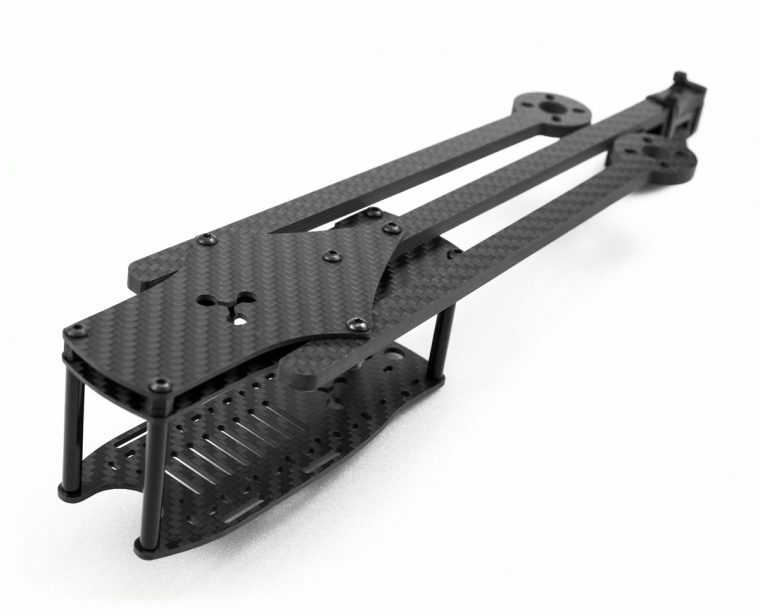 The frame is lightweight, allowing for more battery capacity to be carried at the same final weight. 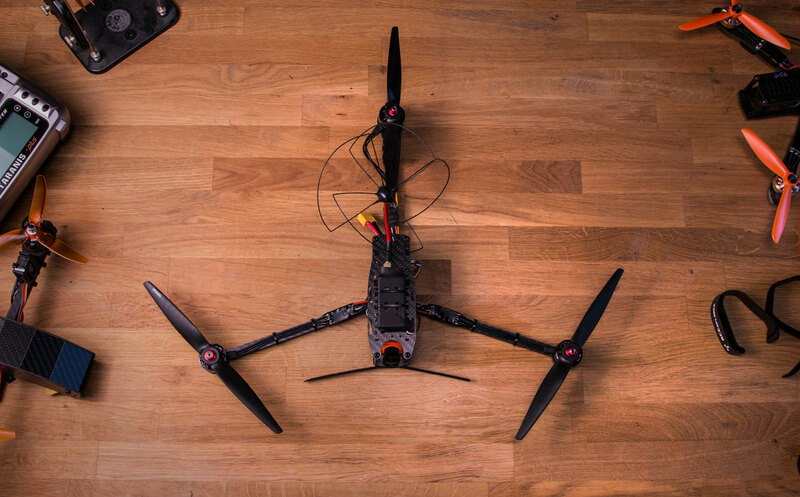 It also swings up to 8″ propellers, which give close to double the prop area compared to a 5″ quad and almost the same disk area as 7″ quad! With only 3 arms, less lift is wasted, due to less air-blocking arm area. 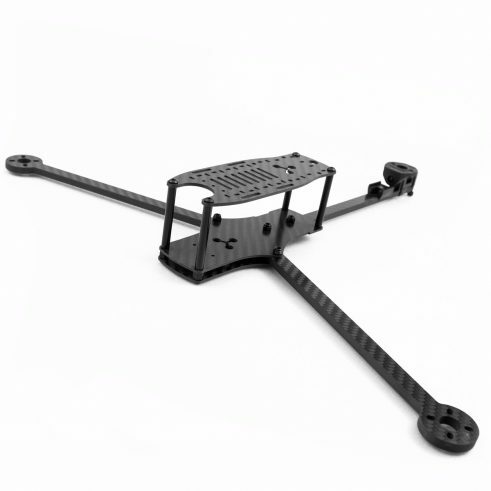 The LR also uses narrower (but thicker) arms to reduce that drag even more, without sacrificing stiffness. 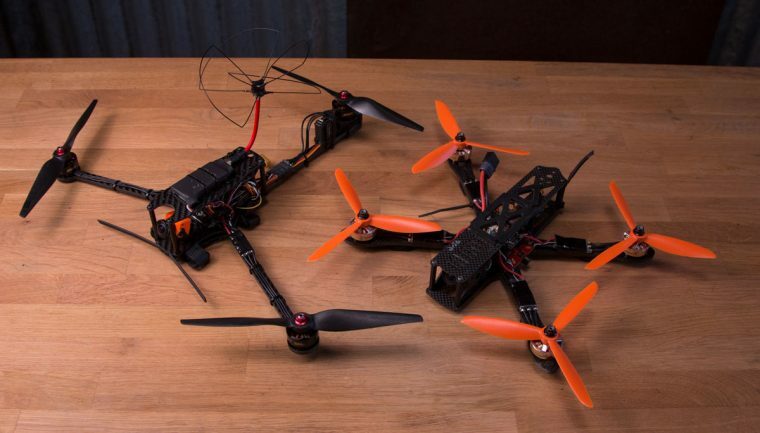 Not a fan of the screaming 5″ quads? 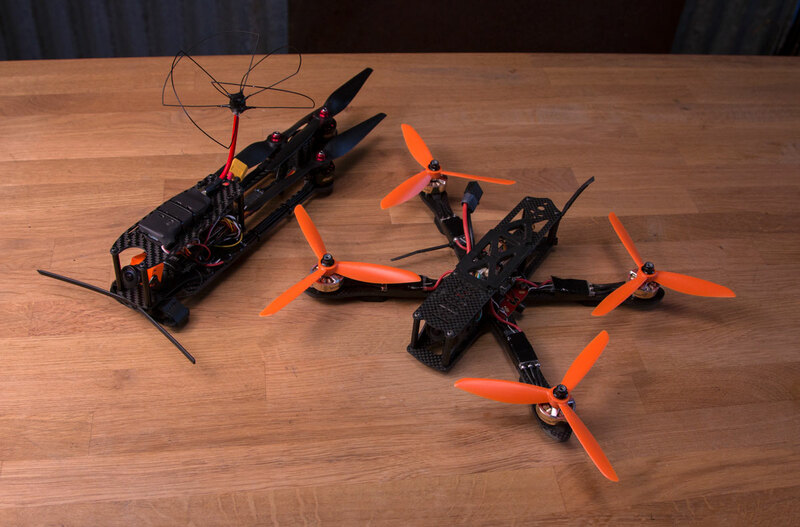 The tricopter LR is very quiet compared to smaller crafts. The larger, slower spinning propellers generate a lot less noise. They are also more efficient, generating the same amount of lift at a lower RPM. Instead of that 5″ high pitched screaming, which draws attention and disturb others, the LR makes a low tone “wosh” sound that doesn’t carry far and is much less annoying to be around. Thanks to the slimmed down design, the tricopter LR frame only weighs 112 grams. That is almost half of the already lightweight Tricopter V4! 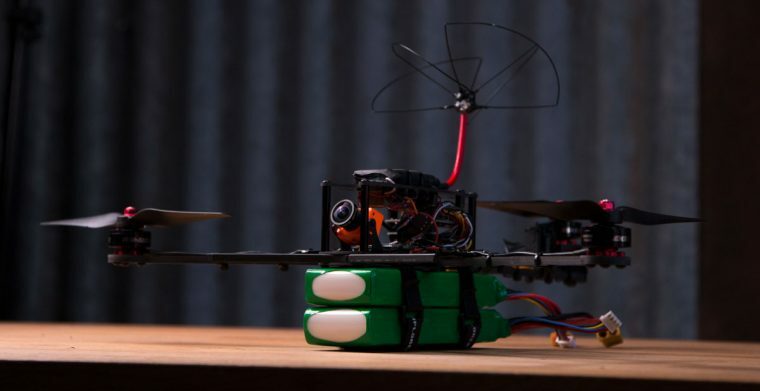 Less weight means more battery carrying capacity, which means longer flight times! 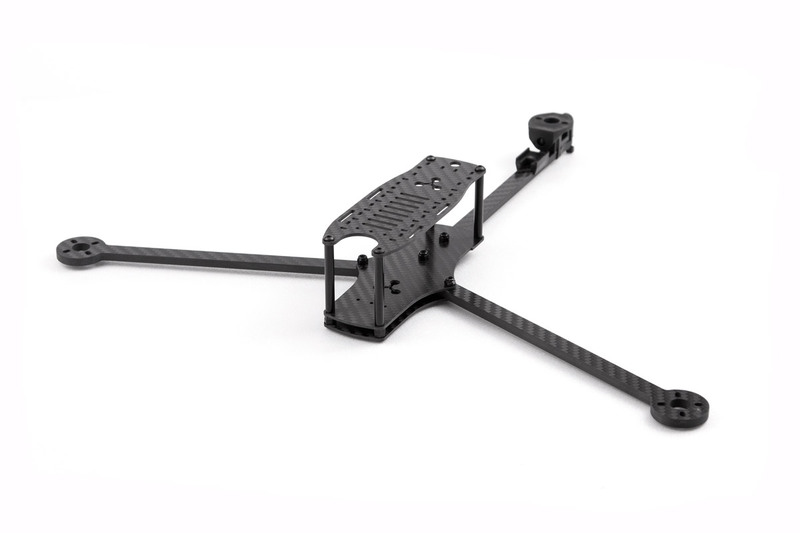 The kit includes a tilt mechanism made from fiberglass reinforced black Nylon which was forged in the fires of Mt. Doom (ok, maybe not), making it almost indestructible. It’s the same plastic used by high-end propeller manufacturers! This tilt mechanism is designed to give minimum air resistance and be as simple, precise, light (only 10.6g) and durable as possible. 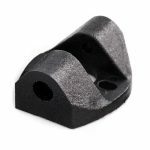 The design features a spline directly integrated into the part. 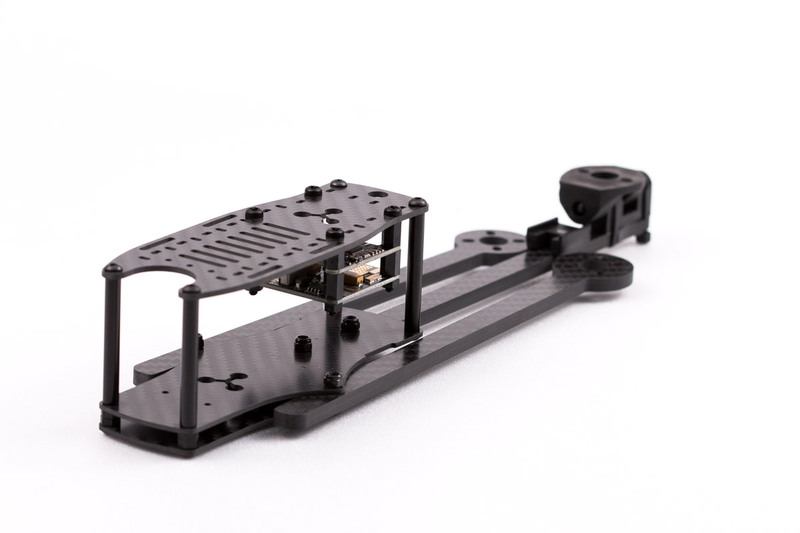 The recommended servo simply slides right in and gets tightened down by the same screw that is used as the pivot point. Simple, strong, and easy to assemble. 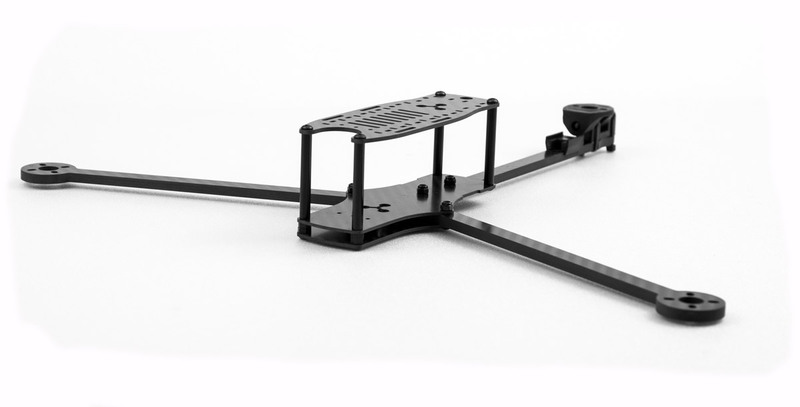 Despite having large 8″ props the Tricopter LR is easily transported. If you pull on the front arms they fold back making the whole copter super compact! 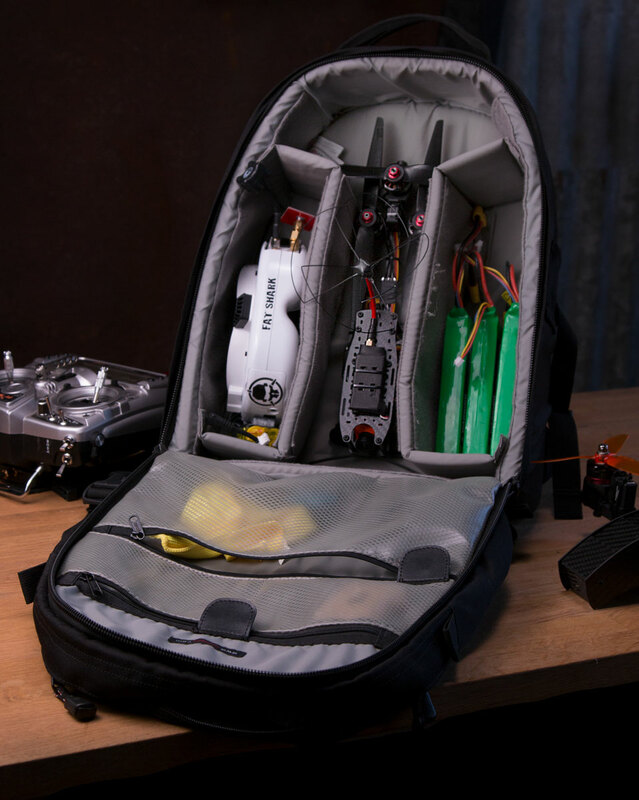 Small enough to fit in a backpack with plenty of room left over for all your other gear. The best part is that no tools are needed for folding and unfolding! This makes transportation easier, and it also helps prevent damage in a crash. The arms can simply fold back and absorb some of the energy on impact. There is extra space in the frame for all kinds of electronics. Mounting a large video TX, GPS, full-size receiver, and such is possible without the frustration and Tetris playing associated with many other builds. Capturing beautiful imagery is a huge part of flying long range. That is why we went to great lengths to make sure that no props are visible in the image (when using the recommended setup). This was no small feat on a copter swinging 8″ propellers on a compact frame but we did manage it! Now you can share gorgeous HD video without distracting props or obstructions. 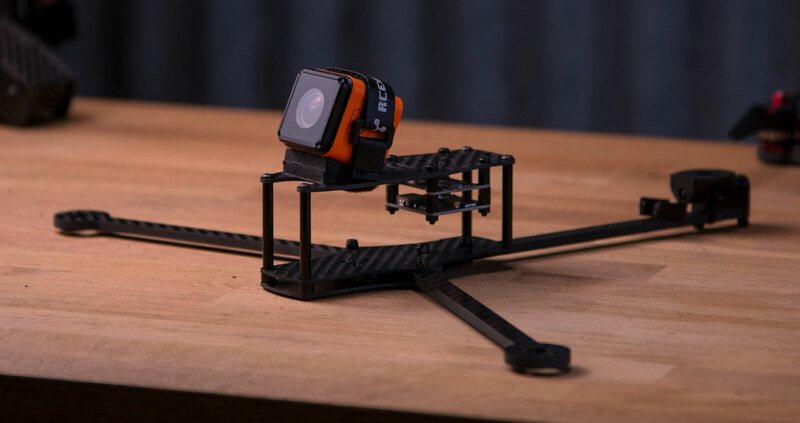 The LR is designed to carry both the smaller GoPro session cube style cameras as well as full-size GoPros even without a 3D printed housing. 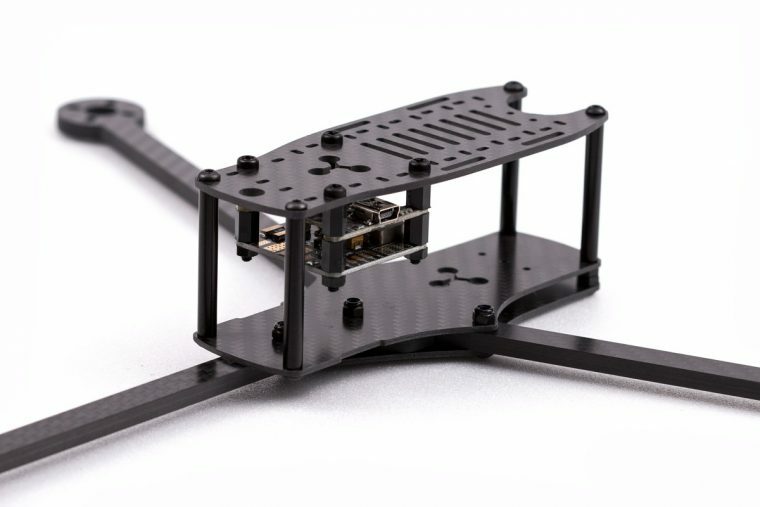 The Tricopter LR also has space for a separate FPV camera, which can be mounted using the lightweight bracket that is included with most modern FPV cameras. 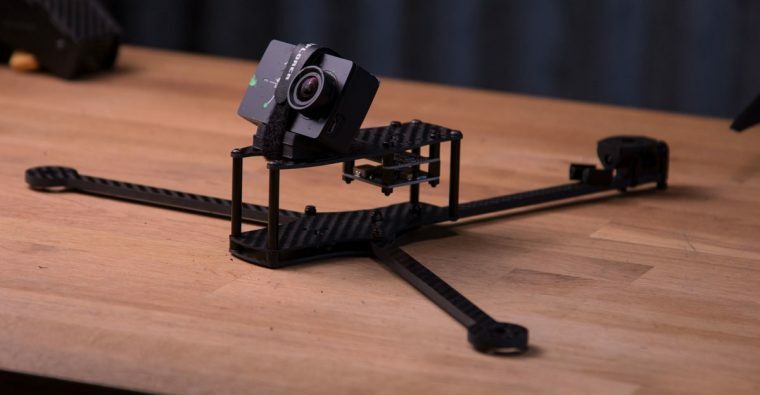 Mount the camera with the lens tilted to your flying style. With the lens tilted up, the setup allows for fast forward flight with the horizon still in the middle of the frame. Thanks to the recent advances in motor technology we now have smaller, lightweight, more powerful and efficient brushless motors. The 6S battery trend on mini quads has lead manufacturers to make lower kV motors in the same small form factor. The Tricopter LR is designed to take full advantage of this, using 3S (for long flight time) or 4S (for bonkers flying). The recommended 1600kV 2207 motors weigh less than half of the motors previously used on the Tricopter V4, yet they are more efficient. 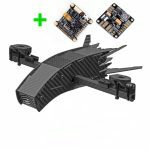 That is even more weight saved that can go towards battery capacity, which together with the higher efficiency of the motors equals more flight time. We have put together a super efficient electronics pack for the Tricopter LR that, with the right battery and a light build, makes it possible to achieve over an hour of hovering flight time! The short answer is: “Swooshiness”. Tricopters have a special feel to them. On quadcopters, yaw is generated by speeding up one pair of the same spinning direction propellers and slowing down the opposite rotating propellers. The difference in rotational force causes the copter to turn very precisely around its middle axis. Yaw motion on a tricopter is different. It’s generated by mechanically changing the angle of the back motor left or right. The back motor literally pushes the tail to the right or left. This creates some interesting flight characteristics. It basically makes the copter feel more like an airplane. The tail acts as a rudder would. On an airplane, if you input a rudder command the plane will try to turn rather than just spin the plane around its own yaw axis. A tricopter kind of makes coordinated turns as you input yaw, just like a plane would. If you’re travelling fast forward and input yaw on a quadcopter it will continue in the exact direction it was going before, but now you’re looking in a different direction. A tricopter would try to ease into a turn. This is what makes it feel more like an airplane, smoother, more fluid, more organic, less like a machine. “Swooshy” in other words. 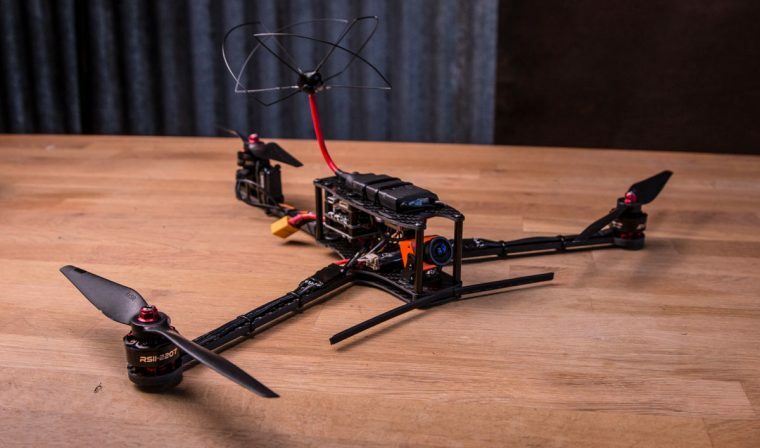 We recommend the Tricopter LR electronics kit. 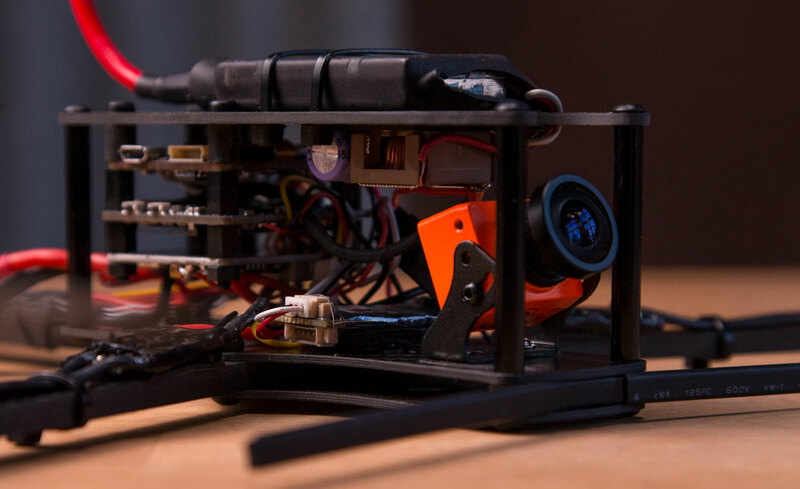 It comes with motors, ESC’s, propellers and the highly recommended special position feedback servo. 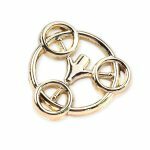 This kit requires an understanding of electronics, proficient skill in soldering, and piloting skill. 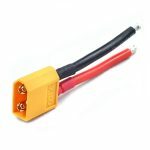 To fly multirotors, based on cleanflight/betaflight and similar, you will need to give constant stick input. The copter will not fly on its own (autonomously), nor will not hold its position in the air in standard configuration. It’s designed to give the best flight experience possible with great flying characteristics. 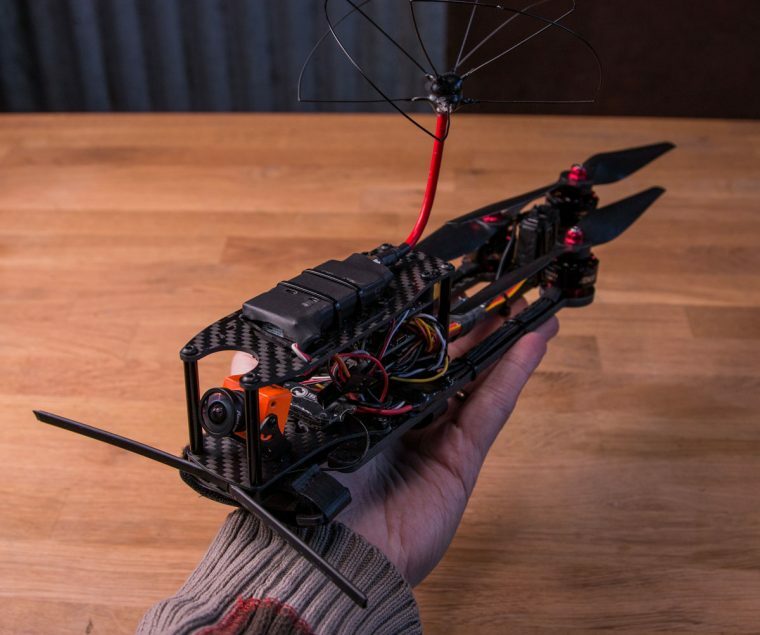 A flight controller of the type this multirotor is using is designed to be felt as little as possible, this in order to let the pilot feel exactly what the copter is doing and to allow for precise flying without the feeling of fighting the flight controller. 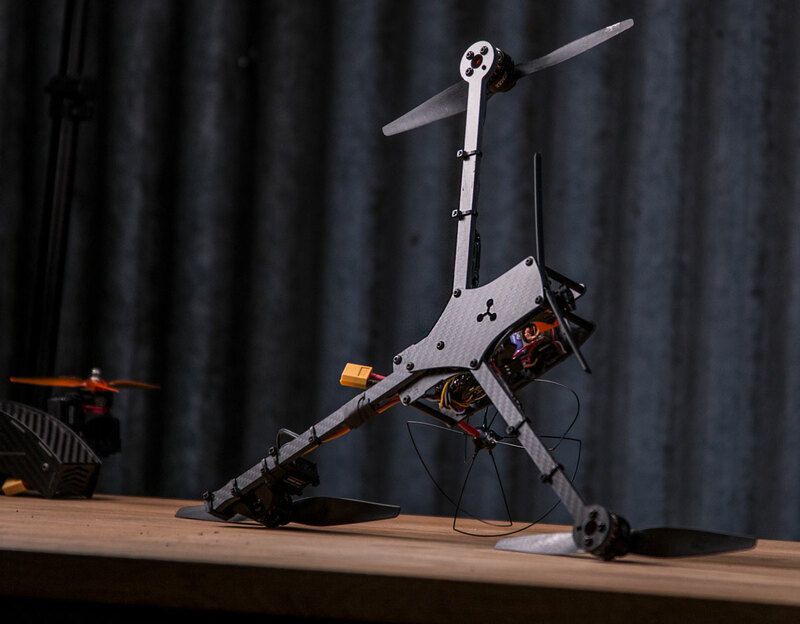 Although tough, the tricopter is not designed as a beginner platform, but to provide the absolute best flight characteristics and performance. It’s possible to learn to fly on it, but I would recommend that you learn on a smaller platform such as the Eflite Inductrix or on a simulator before taking on a multirotor like this. It is possible to connect a GPS to this platform, but functionality in the firmware is still under development. It is not a turnkey solution and it will not perform like a DJI Phantom. Autonomous flight is possible but it will require you to do a lot of research, tuning, and spend a lot of time to get it to work well.